Jen Psaki says Biden was 'running point on Iraq' in apparent attempt to shift blame from Obama for ISIS debacle. In a peppery questioning of Spokesperson Psaki by a reporter, the reporter constantly interjected “So it’s his [Biden’s] fault,” and Psaki didn’t reject the accusation out-of-hand. 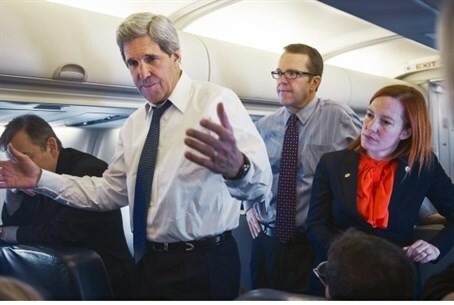 Instead, Psaki pointedly let the accusation go virtually unchallenged while she finished her response. While she eventually halfheartedly denied Iraq was Biden’s “fault,” Psaki immediately pointedly re-emphasized that, “I was saying, actually making the point – and it’s well known – that the Vice President had this [the Iraqi] portfolio . . . that we elevated it [the Iraqi portfolio] to the Vice President. That was who was running point on Iraq." The State Department Spokesperson’s clear attempt to pin the Iraqi debacle and ISIS on Biden could point to a finger-pointing meltdown inside the Administration itself, and raises many additional questions. Did President Obama himself, sanction Psaki’s attempt to call Iraq “Biden’s portfolio,” or was it Secretary Kerry’s decision? It appears there had to be an “executive decision” by Psaki’s superiors before she would have explicitly staked out her “Iraq was Biden’s portfolio” response. Obama’s statement made it appear it was Clapper’s fault and not Obama’s fault. A fierce backlash to Obama’s assignment of the blame to Clapper immediately ensued. In any event, this intra-administration backbiting may be a watershed event inside the Obama Administration itself, and signal possible jockeying as to whom from the Obama administration may run for president of the United States. Up to now, ex-Obama-administration members writing memoirs, like Defense Secretary Gates, Secretary of State Clinton, and Defense Secretary Panetta, have leveled withering, and highly unusual, criticism against Obama’s decisions in Afghanistan, Syria and Iraq while Obama is still in office. QUESTION: So it’s his fault. MS. PSAKI: Let me finish. Went to Iraq – I don’t know the number the times, I’d certainly defer to my colleagues at the White House – and was closely engaged with this issue. There were a range of officials who were working on this within the government – including Secretary Panetta, including Vice President Biden, including Secretary Clinton – who agreed that we could have a residual force there if we could have protections from troops. But we know we couldn’t force the Iraqi Government, a sovereign country, to agree to that. QUESTION: -- in Iraq since is his fault?